Yesterday I posted an article about why you should upgrade to Drupal 6. Today I'm writing the first of a series of posts on how to upgrade, in an effort to make sure you have no excuses not to. When you download Drupal it comes with an 79 line document called UPGRADE.txt. UPGRADE.txt is essential reading when going through an upgrade. So important in fact that you should go and read it now and come back. Done? Very good. As you can see, the document only covers the mechanics of an upgrade. Important information indeed, but it doesn't include any of the dozens of things you may need to do even before you get started. You should not open the document and start executing the steps without planning ahead. If you jump right in you may get to step 9 (Re-install contributed modules) and find that there isn't an upgrade path for one of the contributed modules you use. Today, I'm only covering the first phase. Khalid over at 2bits.com has been doing some benchmarking recently. The results seem to indicate that Drupal core is getting slower. You would think by the comments on the 2bits site that Khalid had committed heresy by reporting his results. But, before we shoot the messenger lets clear a few things up. The purpose of a benchmark is to provide a baseline for the purposes of comparison. A methodology is chosen/stated, tests are done and results are collected and reported. Regardless of what those conclusions are, the 'benchmark' still stands unless there is a flaw in the methodology or method of reporting. A benchmark is usually considered more valid if it is independently reproducible. People can either accept this benchmark as is or attempt to reproduce them to validate or disprove. Benchmarks are not universal. They only report what was tested. The reader is left to draw their own conclusions. Just the other day I wrote about the rebranding of Drupal. 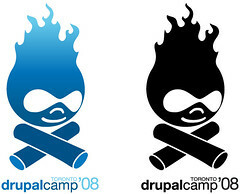 In that post I had guessed that there is a good chance that Drupal would be getting a new 'logo'. It turns out it will be a new 'wordmark'. Over at markboultondesign.com, Mark has posted some sketches and thoughts on the process he's taking to come up with the new wordmark. The post has only been up for a few hours, but there are already over a dozen comments. Everyone is going to have an opinion about the design, but Mark points out that ultimately the wordmark will have to be viewed in the context of the overall redesign of drupal.org. Perhaps people should reserve judgment until the entire rebranding is complete. Bah - but even I can't resist commenting. I can’t help but feeling the sketch looks “dated”. That’s simply my initial gut reaction to the digital sketch - and I’m not sure why my gut is telling me that... but that's the first word that came to my mind.